The MTSM and HTSM offer high-strength truss-to-masonry connections. A submittal/substitution request for the MTSM/HTSM twist straps for cold-formed steel construction. Twist straps do not need to be wrapped over the truss to achieve the allowable load. Minimum edge distance for Titen® 2 screw is 1 1/2". See Titen® 2 screw information. Products shall be installed such that Titen® 2 screws are not exposed to the weather. Lateral loads apply when the first seven nail holes on the truss/rafter near the bend line are filled. Any other fasteners required can be installed in any open hole. Fasteners: Nail dimensions in the table are diameter by length. Titen 2 concrete/masonry screws are Simpson Strong-Tie concrete/masonry screws. For additional information, see Fastener Types and Sizes Specified for Simpson Strong-Tie Connectors. HTSM See specific model numbers for code listings. MTSM See specific model numbers for code listings. 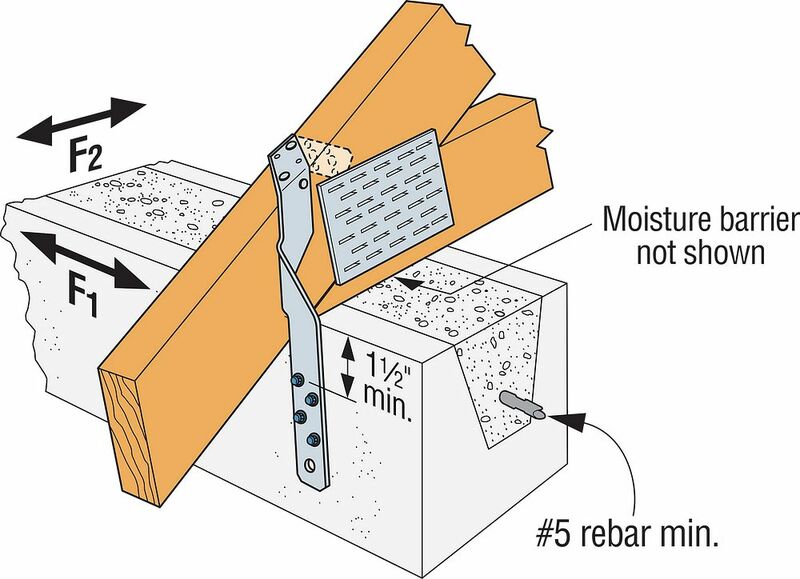 High Wind Resistant Construction Detail D45: Stud to Band Joist - HWRC D45 Stud to Band Joist"